The City of Duncanville Fire Code is governed by the International Fire Code 2015 edition, as well as adopted by the City of Duncanville’s Code of Ordinances, which forms the essential requirements to provide exceptional safety standards for the citizens and visitors of Duncanville. The City of Duncanville has adopted and currently enforces the 2015 International Fire Code with the recommended amendments from the North Central Texas Council of Governments (Option B). Section 904.2.2 states: Each required commercial kitchen exhaust hood and duct system required by Section 609 to have a Type 1 hood shall be protected with an approved automatic fire extinguishing system installed in accordance with this code. A basic floor plan with the location of the hood and cooking equipment. Manufactures specifications on all fire protection equipment. Drawings and specifications of piping, nozzles, manual pull stations, fuse links and cylinder locations. Drawings and specifications of all utility shut-offs. Owner and business name, address, and phone numbers which shall include emergency contact number. If the building is protected by a fire alarm, extinguisher system must be tied in which will require additional fire alarm plans. Location of Class K portable fire extinguisher and instruction sign. Copies of licenses and insurance. If deemed necessary, the Duncanville Fire Marshal may require additional equipment or protection. Once plans are approved and a permit is issued, work may begin on installation. When installation is complete and successful testing is one, the Fire Prevention Office shall be contacted to schedule a “final” acceptance test. Acceptance testing must be scheduled at least 48 hours in advance by contacting the Duncanville Fire Prevention Office at (972) 780-5049 or (972) 780-5047. Fire extinguishing systems shall be serviced by a licensed fire extinguisher company at least semi-annually. The extinguisher service technician shall have their license on their person while at the job site. A tag meeting all State of Texas Licensing requirements shall be attached to the system at all times indicating the last date of service. Any extinguisher system receiving an unsatisfactory inspection indicated by a red or yellow tag from the extinguisher company will be deemed out of compliance. The Duncanville Fire Marshal shall be notified immediately of systems out of service by the extinguisher company, and a written report left with the business. All pre-existing Vent-A-Hoods shall be professionally cleaned from the hood to the exterior fan prior to calling for a Certificate of Occupancy Inspection. No Exceptions. The Duncanville Fire Department will inspect each vendor before the event to ensure compliance with the Duncanville Fire Code. Food trucks must pass a fire inspection not less than 5 days prior to the event at 1530 S. Main St. Duncanville, TX. Contact us at 972-780-5047 or 5049 for an appointment. All food trucks shall have an operating, clean Type I hood with fire protection in place-no exceptions. Food truck vendors shall provide a fire protection hood system in accordance with NFPA 96. A K Class extinguisher is required within 30 feet of the hood system. Current inspection tags are required on all fire protection. NOTE: Hood systems must be inspected every 6 months, portable extinguishers are inspected annually. Food trucks shall also have a minimum 5lb ABC portable extinguisher available for fires located outside of the kitchen- engine compartment, etc. NO COOKING IS ALLOWED OUTSIDE OF THE FOOD TRUCK! Other food vendors that are cooking any foods that create grease laden vapors shall supply a class K extinguisher. The extinguisher shall have a receipt of purchase dated within the last year or serviced and tagged by a licensed fire extinguisher company within the last year. Used oils shall be disposed of off-site. Participating food vendors that are conducting any kind of cooking, grilling, or smoking shall provide a 5 pound ABC extinguisher. The extinguisher shall have a receipt of purchase dated within the last year or the extinguisher shall have a licensed inspectors tag attached within the last year with the explanation of service performed. Any fuel gases used such as propane shall be in proper, undamaged containment systems. Damaged (rust, corrosion etc.) service connections will not be allowed. Bottles/tanks shall not have dents or damage that could render the vessel unsafe and shall be stored and used in accordance with the International Fire Code 2009 Chapter 38 and NFPA 58. Extension cords shall be in good condition. Cut, spliced or taped extension cords will not be allowed. Cords shall not cause a trip hazard and be located away from water or water based substance and shall be grounded. Generators shall be confined within in the vendor area and not accessible to the public. DO NOT refuel while the generator is running. Generators shall be in good working condition. General housekeeping should be neat and organized. Flammable substances shall be appropriately stored and kept the away from open flames or heat sources under the provisions of the International Fire Code 2009 Chapter 34. Not meeting the requirements listed above may result in denial of participation in the event. The City of Duncanville has adopted and currently enforces the 2015 International Fire Code (Option B) including the recommended amendments from the North Central Texas Council of Governments and local amendments. All alarm companies should pay special attention to the amended section 907.6.1 (Wiring). Added – Section 907.6.1.1 requires all initiating circuit conductors to be Class “A”. The review companies will charge review fees, which are not regulated by the Duncanville Fire Department, and does not include the required permit application fee. After plans are reviewed by one of the above listed companies, the review company will submit a final copy of the plans for review/approval. A permit will be issued if plans are approved. The applicant will be notified of plan approval and advised of the permit cost, which is based on the total number of devices. Permit fees shall be paid to the Duncanville Fire Department in the form of cash, check or money order. Debit/Credit Cards will not be accepted. Work may only begin once a permit has been issued. Once work is completed and successful testing has been done, the alarm company shall contact the Fire Marshal and/or Fire Inspector at least 48 hours in advance to schedule an acceptance test. When conducting any fire alarm service, repair, or installation in the City of Duncanville, technicians shall have on their person a current copy of all licenses held within the State of Texas. Technicians not possessing a valid fire alarm license will be instructed to leave the job site and the information will be submitted to the State Fire Marshal Licensing Enforcement Section. If a fire alarm system is found to be out of compliance, indicated by a yellow tag, or out of service, indicated by a red tag, it shall be the responsibility of the technician to immediately notify the Duncanville Fire Prevention Office. An inspector will visit the facility as soon as possible to determine a course of action and bring the system into compliance. At no time shall a fire alarm system be left with a red or yellow tag without informing the owner or manager on duty in writing that the system is out of compliance or out of service and the Fire Marshal is being notified. Every attempt shall be made by the technician to repair system failures when conditions allow. SECTION 503.2.1 Dimensions: Fire apparatus access roads shall have an unobstructed width of not less than 24 feet, except for approved security gates in accordance with Section 503.6 and an unobstructed vertical clearance of not less than 14 feet. SECTION 503.2.2 Authority: The fire code official (Fire Chief/Marshal) shall have the authority to require an increase in the minimum access widths and vertical clearances where they are inadequate for fire or rescue operations. 503.3 Marking- Striping, signs, or other markings, when approved by the code official (Fire Chief/Marshal), shall be provided for fire apparatus access roads to identify such roads or prohibit the obstruction thereof. Striping, signs and other markings shall be maintained in a clean and legible condition at all times and shall be replaced or repaired when necessary to provide adequate visibility. (1) Striping- Fire apparatus access roads shall be continuously marked by painted lines of red traffic paint six inches (6”) in width to show the boundaries of the lane. The words “NO PARKING FIRE LANE” or “FIRE LANE NO PARKING” shall appear in four inch (4”) white letters at 25 feet intervals on the red border markings along both sides of the fire lanes. Where a curb is available, the striping shall be on the vertical face of the curb. (2) Signs- Signs shall read “NO PARKING FIRE LANE” or “FIRE LANE NO PARKING” and shall be 12” wide and 18” high. Signs shall be painted on a white background with letters and borders in red, using not less than 2” lettering. Signs shall be permanently affixed to a stationary post and the bottom of the sign shall be six feet, six inches (6’6”) above the finished grade. Signs shall be spaced not more than fifty feet (50’) apart. Signs may be installed on permanent buildings or walls or as approved by the Fire Chief. 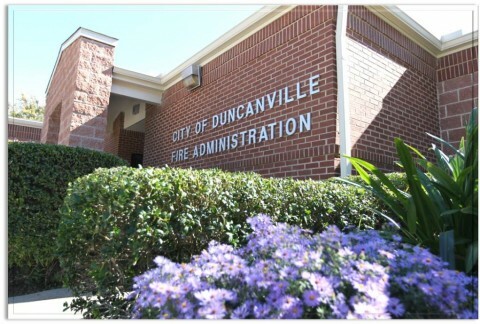 The Duncanville Fire Department shall make periodic inspections of fire lanes to verify compliance. For additional information contact Duncanville Fire Prevention. A State of Texas licensed company and service technician shall perform all annual inspections and service to heaters. Heaters shall be inspected AT LEAST ANNUALLY. At a minimum the following components shall be checked for proper operation on furnaces and heaters: gas burners or electric heating element(s), thermostat, blower motors, wiring, clear ventilation space around units-minimum 18” in front, vent stack connections and adequate room ventilation, corrosion, faceplates and panels in place, dust buildup. Problems found during the inspection shall be brought to the attention of the manager/owner prior to leaving the facility. If possible, repairs should be made by the service technician prior to leaving the facility and documentation of the repair provided. A heater inspection report shall be filled out and left at facility detailing results of inspection with all items in #3 addressed. This report can be the same as an invoice as long as the minimum requirements are met. This report does not relieve the service company of checking all components necessary to complete a quality inspection and leave the unit(s) in good working order. Heaters and furnaces needing major repairs shall be placed out of service and the manager/owner should make every effort to have the repairs made ASAP by a State of Texas licensed provider. Heaters and furnace types and brands are wide and varied. Service in your facility should always be from professional and capable companies familiar with your equipment. Addressable, monitored fire alarm system. Contact a State of Texas licensed fire alarm company for installations, modifications or service. Fire sprinklers are required for Group I Child Care Facilities (providing care for children less than 2 ½ years old). Day Care Facilities providing care for children older than 2 ½ may not need to sprinkle unless required by the State of Texas. Gas inspections are required prior to occupancy and on a bi-annual basis by a licensed plumber if the building uses natural gas or propane. A failing gas inspection may cause the center to be closed until repairs are made. A written report from the company shall be provided and filed at the day care and available for inspections. In addition to the gas inspection, all heaters in the facility shall be serviced prior to occupancy and annually by a licensed company. A written report shall be provided and filed at the day care and available for inspection. Address numbers shall be installed in a contrasting color to the building color scheme on the front and rear of the building. Numbers shall be a minimum of 6 inches in height, Arabic numerals and have a stroke width of 0.5 inches. Emergency and exit lights with battery backup shall be installed and operational prior to occupancy. Contact Building Inspections (972) 780-5040 for locations. Fire extinguishers shall be installed in the building as well as vehicles transporting children per NFPA 10 (min. size is 5 lb. ABC) by a licensed extinguisher company. All exit doors shall be equipped with approved/listed panic hardware prior to occupancy. Additional fire protection is required for restricted egress/access doors (electronic or mag locks). The facility shall have a fire evacuation plan in place prior to occupancy. The plan should include 2 safe routes of exit from the building. Plans/maps shall be posted in every room the children occupy. The plan should include an alternate site for relocation if your building is not safe to re-enter. The minimum safe distance is 50 feet from the exterior wall after exiting the building. At least one Carbon Monoxide detector shall be installed per the State of Texas. The facility shall conduct monthly fire drills and maintain records for not less than three years. The fire alarm shall be used for all fire drills. The alarm should put on test during the drill. New staff shall be trained immediately on fire procedures. Fire lanes are required when any part of the building exceeds 150 feet from the main road. Fire prevention will provide marking/striping requirements for you to forward to your contractor. Obtain and post City of Duncanville Certificate of Occupancy. Duncanville Building Code Enforcement is located at 203 E. Wheatland. Maintain 36-inch clear space in front of all electrical panels. The facility shall have a tornado/severe weather plan in place prior to occupancy. An alternate location should be part of the plan in the event the building is not safe. The Duncanville Fire Department has adopted and is enforcing the 2009 International Fire Code including the Recommended Amendments from the North Central Texas Council of Governments. NFPA standards referenced in the 2009 IFC are also adopted and enforced. All restaurants over 5000 square feet or have an occupant load of 100 or more must be sprinkled. Plans from a licensed sprinkler company are required for review and approval, (see sprinkler and fire alarm plan submittal and review process). An automatic monitored fire alarm is required when the business has automatic fire sprinklers. Contact the Fire Prevention Office for specific requirements. You will be required to submit plans from a licensed fire alarm company for review and approval, (see sprinkler and fire alarm plan submittal and review process). An automatic fire protection system shall be installed to protect cooking equipment and ventilation hood. Your extinguisher company will be required to submit plans to the Duncanville Fire Department for review and approval. There is a plan review fee due when the plans are dropped off (see kitchen hood system requirements). Exit doors are required to have panic hardware or other approved exiting capabilities. Emergency and exit lighting with battery backup is required. Portable fire extinguishers are required. Contact a State of Texas licensed company to install or service extinguishers. Smoke alarms are required in office and dining areas. This will be part of your fire alarm system if required. Occupant load must be posted. Contact Duncanville Building Inspections for calculating occupant load. We will evaluate each restaurant for compliance with the fire code. The Duncanville Fire Department may require additional protection or modifications. Contact the Fire Prevention Office prior to occupancy or beginning any work. The City of Duncanville currently enforces the 2015 International Fire Code. Section 2404.4 FIRE PROTECTION: New and existing spray booths and spray rooms shall be protected by an approved automatic fire-extinguishing system complying with Chapter 9. Protection shall also extend to exhaust plenums, exhaust ducts and both sides of dry filters when such filters are used. The design and construction of spray booths shall comply with Chapter 24 of the 2015 IFC, NFPA 33, NFPA 72, NFPA 17, NFPA 17A, NFPA 12. A basic floor plan with the location of the booth and mixing rooms and distances (min. 3 feet) from all walls. Drawings and specifications of piping, nozzles, manual pull stations, fuse links, cylinder locations and portable fire extinguishers. Drawings and specifications of all utility shut-offs including air compressors. Owner and business name, address, and phone numbers- include emergency number. If building is protected with a fire alarm, extinguisher system must be tied in (plans required). Spray booths shall be constructed of approved noncombustible materials. Aluminum shall not be used. Duncanville Building Inspections should be contacted regarding mechanical, electrical, construction and ventilation issues, (972) 780-5040. These are minimum requirements; the Duncanville Fire Marshal is authorized to require additional equipment or protection. When plans are approved work may begin on installation. When installation is complete, and successful pre-testing is done, the Fire Prevention office shall be contacted for a “final” acceptance test (972) 780-5047 or 5049. Please call 48 hours in advance for acceptance test scheduling. Fire extinguishing systems shall be serviced at least semi-annually. A licensed fire extinguisher company must perform this work. There shall be a tag affixed to the system indicating the last date of service. Any extinguishing system receiving an unsatisfactory inspection (red or yellow tag) from the extinguisher company, shall discontinue spraying operations until corrections can be made. The Duncanville Fire Marshal shall be notified immediately when systems are out of service or compliance.